Billionaire and Africa's richest man, Aliko Dangote, has signed a $650 million loan facility with the African Export-Import Bank for his oil refinery project in Nigeria. The seven-year term loan would attract a moratorium of five years, according to facility terms read out during the signing. Cairo-based Africa's trade bank also signed a $750 million facility with Nigeria's development bank, the Bank of Industry. Reuters witnessed the signing of both loans on Saturday. Dangote Group Executive Director Devakumar Edwin told Reuters last week that the oil refinery would cost around $10 billion and should be completed by December 2019. He said the company would borrow $3.3 billion for the project, arranged by Standard Chartered Bank. The remainder will be funded by equity and through export agencies. Dangote built his fortune on cement and now has interests in flour milling, agriculture and real estate. He is building the world's largest single oil refinery and also expanding into fertilizer, aiming to address long-standing problems in Nigeria's energy markets. 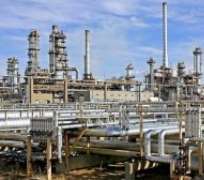 The refinery and petrochemical complex is located on 25,000 hectares of swampy land with a jetty to ferry products by sea within Nigeria and abroad including an undersea pipeline to transport gas. It would account for half of Dangote's sprawling assets when it is finished next year. Dangote intends to process different grades of crude to meet local demand for refined petroleum products and also target export markets abroad. Afreximbank, celebrating its 25 years of operation this year, aims to foster intra-African trade through the creation of a payment platform to ease settlement and currency risks.